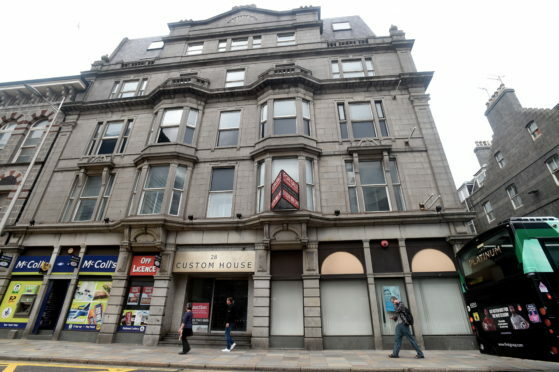 An Aberdeen office block could become a new hotel if plans are approved by councillors next week. Mandale Construction North has applied to transform the six-storey Custom House, on the corner of Guild Street and Stirling Street, into a 106 bed hotel. Next Thursday’s planning committee will debate the application due to an objection by Castlehill and Pittodrie Community Council. The group has raised concerns over the high concentration of hotels in the area and a lack of affordable housing. A report to councillors reads: “It is important there are a variety and mix of uses and healthy balance of amenities and activities available throughout the city and around the city centre. There have, however, been no other objections. Under the plans, the ground floor would feature a reception area, bar and dining room, three bedrooms and back-of house space. The upper floors would contain the remainder of the bedrooms, which would be a variety of sizes. Council planners have recommended that elected members approve the plans, with conditions. Their report notes: “Custom House has been vacant for several years and with a large amount of new and grade A office floor space now available within the city centre, it is unlikely that the poorer quality space which the building offers is going to be attractive to potential occupiers.